There are plenty of reasons to need to climb a tree: to cut branches off, getting to safety, or eliminating a threat that could be at the top. Knowing how to climb a tree safely and effectively is the best way to protect yourself and those around you. Some people believe that it’s as simple as one hand in front of the other, but it’s quite easy to lose your grip, and a fall from high enough can even kill you. There are safer ways to tackle the problem you face, depending on the equipment you have with you at the time. 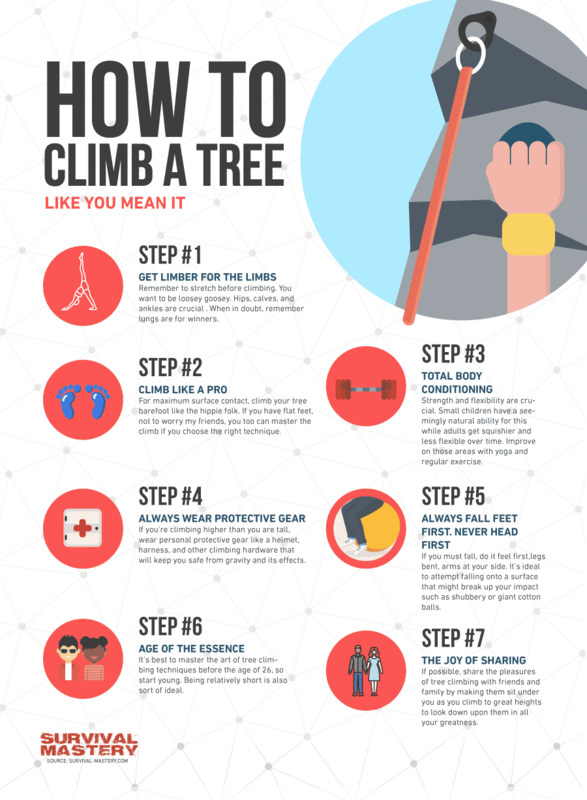 See our guidelines on how to climb a tree for more information. In order to stay safe when climbing a tree, it’s important to be aware of what you’re wearing. You want your clothing to be loose enough that allows for a range of movement. But be aware that clothing that’s too baggy can result in it being snagged on branches, and getting stuck is not only embarrassing but dangerous. Take a look at our article on the best gear for climbing to make the experience safe. You want to remove any loose jewelry, such as necklaces or bracelets, and remove any unnecessary accessories, as they can also get snagged when you’re climbing. Shoes with good traction are also important in order to provide the grip you’ll need to stay on the branches you’re climbing. If you don’t have such shoes, then climbing barefoot is definitely a better alternative. And, in the event that you’ve discovered your tree is safe from all of these hazards, there are still weather conditions to contend with. A tree may be strong and sturdy, but inclement weather can make the activity even more dangerous. Don’t climb during a thunderstorm or when there are strong winds present, as this increases your risk of injury and/or being electrocuted. Rain can make branches slipperier than you imagine, and you can end up falling. Cold temperatures tend to make branches more brittle and can break more easily under your weight. If you have no choice, then you should test each branch with your weight before you decide to use it as support. Getting up a tree is dependent on how high the lowest branch is. If you can easily reach it, then test it to see if you can hold your weight. If it is, then wrap your hand and the other arm around the trunk, then place your feet on the base of the tree to help pull yourself up. If the lowest branch is too high, then there are other methods you can use to get yourself up to it. Be aware that these methods are quite difficult and should only be attempted if you’re confident enough to pull them off. the coconut palm technique can work if your hands and feet are strong enough. Keep your body close to the tree and hug it with your arms and thighs. Then use your hands and feet to work your way up the tree to the nearest branch. Once you’ve gotten a hold of the branch, you need to pull yourself on top. Pulling yourself up with your arms may be enough if you have great upper body strength, but you may need to swing your feet up in order to help you. Then it’s time to figure out the best route for you to take. This usually entails picking the nearest branch to you, but that may not always be safe or viable, given the position and direction of the limb. Avoid branches that are smaller than three inches around, as well as broken or dead branches. When in doubt about climbing, follow the three-point rule, especially when you’re not using any equipment. Three out of your four limbs should be anchored securely to the tree at all times, usually by different parts of the tree. This minimizes your chances of losing your balance and falling from the tree. At all times, you should stay upright and square your hips below your shoulders whenever possible. Don’t venture out towards the ends of branches, as they are more prone to breaking. Always stop climbing when the trunk of the tree is smaller than four inches in diameter. When it’s time to descend, pick the same general path as you used to climb up, as you already know which branches will hold your weight. 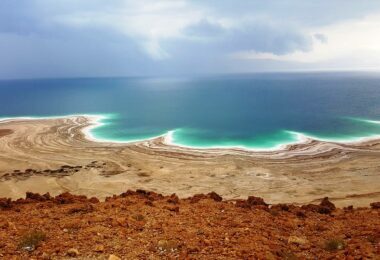 Take your time in climbing down, as you’re still just as prone to falling. Before you can start climbing with equipment, it’s important that you have the right things before you start. If you are getting your equipment from a sporting goods store, you can ask the employees to help you out so that you won’t waste your money on stuff you don’t need. throw line: a brightly colored thin rope that is thrown over a branch. This is attached to a weight on the other side. static rope: this is used to climb, and will help you remain stable. harness and helmet: these are designed to help keep you safe in your climb. 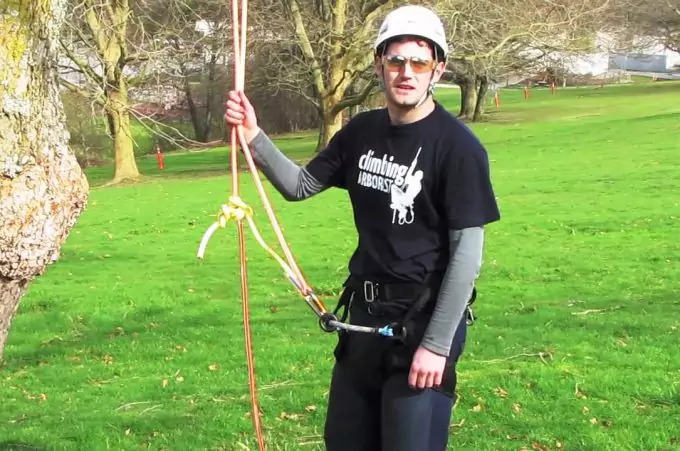 Your harness should be designed for tree climbing. Prusik cord: this is attached to your climbing rope and your harness through the use of a carabiner. See our piece on how to choose the best carabiner for safety. branch protector: this protects the branches from friction and helps your rope to last longer. In selecting a branch to throw your rope over, you want one that’s bigger than six inches in diameter. The double-rope technique is going to be used throughout the rest of these instructions as it is the easiest to follow for beginners. Tie your throwing line to a weight to help you get it over the branch you want. Place your branch protector on the rope, and then tie your static rope to the throw line. Pull on the other end of the throw line until the branch protector ends up on the branch. Secure the two ropes together using a Blake’s hitch; this is a knot that will go slack when your weight is off the rope and tighten again when you stop moving. Tie a double fisherman’s knot to your carabiner to secure it. You should spend some time learning these knots before you start climbing. Then put on your harness and helmet, and attach yourself to the rope system. Your harness should be quite snug with your body so that you don’t slip out. If you don’t have a lot of upper body strength, then adding a Prusik cord to serve as a “foot assist” can help you to climb. Then, as you climb, tug the Prusik cord higher up as you go. When you’re ready to descend, simply grab the Blake’s hitch knot and gently pull down. Don’t do this too fast or you could end up injuring yourself. This is the oldest and most well-known technique for climbing trees, and is still used by many technicians who service telephone and light poles to this day. The technique is still the same, though the equipment has been improved upon in order to minimize falling and injury. spurs: these are the most important parts. The spike should protrude from the instep of the foot in order to give you the grip you need to climb. The pads should also fit well, getting some professional assistance in finding the right fit is key. Equipment that doesn’t fit well can cause you to fall. 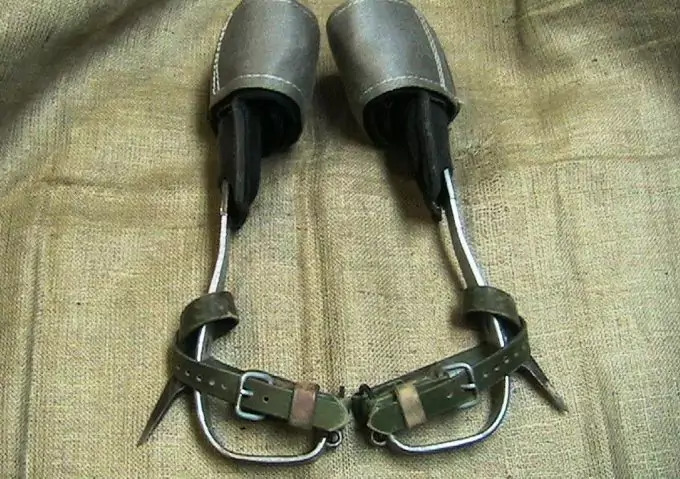 saddle: also known as a harness, this fits around the hips and legs, and provide a say way of connecting a climbing line to your waist. 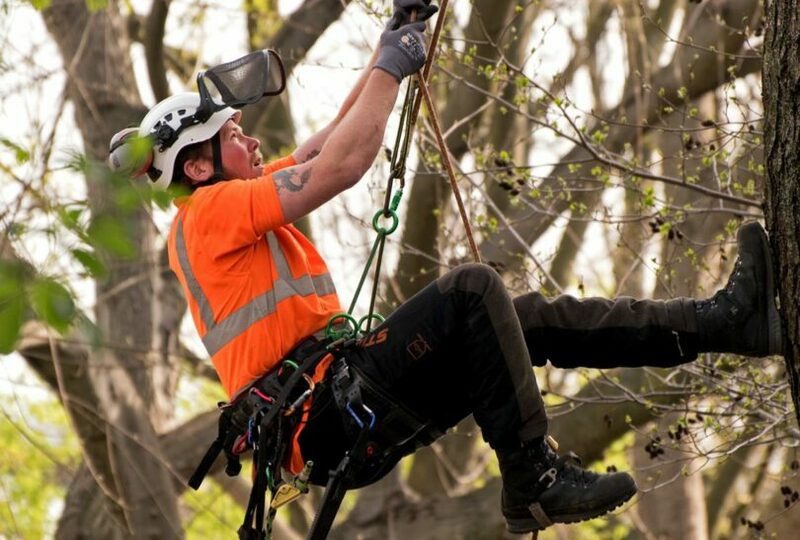 flipline: this strap goes around the tree and connects to the D-rings on both sides of the harness. As he climbs, he flips the rope higher up the tree to the same height as his body, providing tension to keep him aloft. A backup flipline is useful for getting around branches without having to untie your current line. flipline adjuster: this adjusts the size of the flipline according to the circumference of the tree, as well as the change of its diameter as you ascend and descend the tree. Prusik line: also known as the ascender, it was originally designed for climbing the rope, but has been adjusted for use with a flipline adjuster. It has a locking snap spliced onto a Prusik loop, and is then tied to the flipline with a knot. carabiner: it should be a locking type to maximize safety. In learning how to spur climb, inspecting the tree is also necessary to determine whether it can be climbed safely. 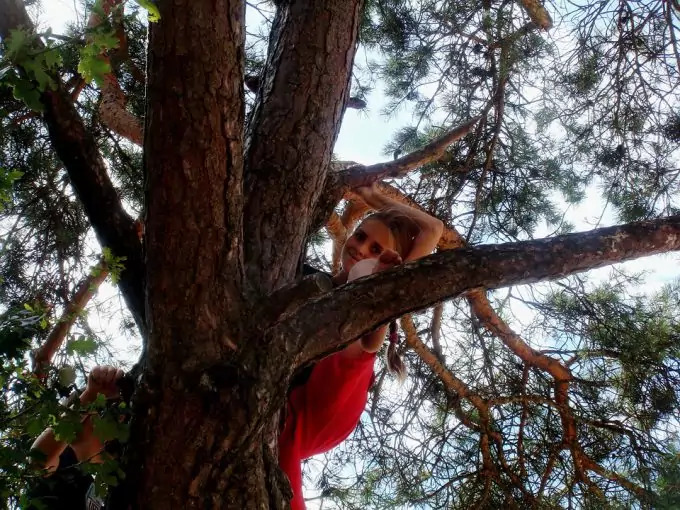 The same precautions that were started earlier in this article should be used in determining whether it is safe to climb a certain tree. When it comes to ascending, strapping on your equipment first and making sure it’s secure will keep you safe. Start by throwing one end of the flipline around the tree and catching the other end in your hand. Connect both ends to the D-ring that is on the opposite side of the saddle from the adjuster. Using your spurs, you should quickly gain purchase in the tree and use the flipline to keep you against the trunk. Stab the spike (or gaff) into the tree and step up. It’s important that the gaff is inserted at the right angle with your knee at least 6-8 inches away from the tree, or else it will simply separate from the trunk when it is stepped on. Take two to three steps up using this method, and then toss the flipline up to your level so that it is kept in pace with you. The tension should be kept on the line to stop you from falling then. When branches are encountered, there are two methods that can be used: the branches can be cut off or an alternative flipline can be used to get around them. Branches that are small enough can be bypassed with the flipline and left unharmed. As the trunk becomes smaller, the flipline should be shortened with the adjuster in order to maintain the tension. Once you’ve reached a desirable height, getting back down can be done in one of two ways. If a climbing line has been installed, then it’s just a matter of using this to get back down. One of the most common ways in getting down with a climbing line involve the use of a self-belay using a friction hitch or a Prusik loop, or having another person belay you down. If not, then you’ll have to get back down the same way you did in getting up. It can be a little bit more difficult to get down this way, but it’s not impossible as long as extra care is taken. Spur climbing does have its advantages and disadvantages, if you’re looking to compare which climbing method should be used. On the plus side, spur climbing is very fast and efficient. However, the method is only used in very specific situations, such as the removal of trees or aerial rescues. This is because the spurs damage the trees and can cause them to die much more quickly through the introduction of disease and bugs. For this reason, it’s important that you only use spur climbing equipment if you have permission to do so or are climbing in the outdoors of your backyard. Climbing trees can provide you with sights you weren’t capable of seeing from the ground, and can be an invigorating experience. 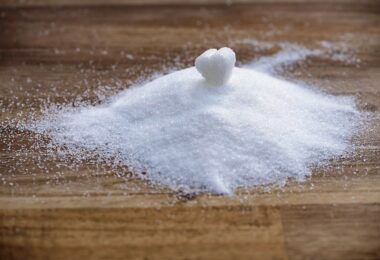 It can be a little tricky at first, especially if you’re afraid of heights, but by exercising caution and making sure your equipment is in working order, you’ll have very little to worry about. In the event of your first tree climb, it can be helpful to take someone along with you during your hiking trip so that you can have someone to spot you and possibly contact emergency services when things go awry. However, after your first climb, you’ll want to do it again and again, that it soon becomes an addiction that you’ll never want to curb. The exhilaration of being so high in the branches and seeing the view from the tops of trees will make you want to take up this activity each time to go hiking.